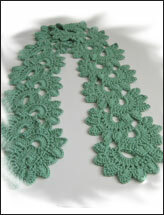 I crocheted and knitted scarves, hats, and hand cuffs as presents when I was five. I really enjoy crocheting, knitting, sewing and across point. In my family, there are a lot of ladies who are good at crocheting or knitting. I like to make fashionable or new styles in an easy and simple way. So all of my patterns are easy and simple to understand and follow. At the beginning, I just recorded the steps or stitches as a note for myself, and then my friends asked me to share my notes. Now I can turn my ideas into patterns. I created at least 200 patterns for 2009. Crochet, knit and be with my family. Crochet hook, yarn and family pictures.